Text difficulty You can tell how difficult a book is to read using text difficulty. This score doesn't address the age-appropriateness of a title. Text difficulty scores are presented as a range of grades (U.S.) or school years (international).Text difficulty scores are created by OverDrive, Inc. and are based (where available) on a weighted average of the ATOS level and Lexile scores' grade equivalents, as presented in literature from the National Governors Association Center for Best Practices and the Council of Chief State School Officers. Interest levelYou can tell how age-appropriate a title's content is using interest levels. This score isn't related to reading difficulty. Interest levels include: LG (Lower Grades, K-3), MG (Middle Grades, 4-8), MG+ (Upper Middle Grades, 6 and up), and UG (Upper Grades, 9-12). Interest levels are determined by Renaissance Learning, Inc., as a part of their Accelerated Reader 360® program. To learn more, see the Parent's Guide to Accelerated Reader 360®. ATOS™ book levelYou can tell how difficult a book is to read using ATOS levels. These are based on the ATOS readability formula, which evaluates the number of words per sentence, the number of characters in each word, and the difficulty of the words. ATOS levels are determined by Renaissance Learning, Inc., as a part of their Accelerated Reader 360® program. For more information, see the Parent's Guide to Accelerated Reader 360®. See this chart for the correlation between ATOS levels and grade levels. 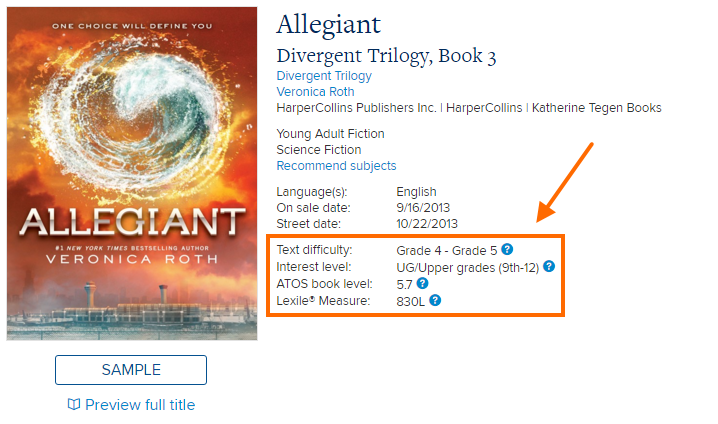 Lexile® MeasureYou can tell how difficult a book is to read using Lexile measures. The Lexile measures, which are based on word frequency and sentence length, are reported by MetaMetrics. For more information, including the correlation between Lexile measures and grade levels, see Lexile-to-Grade Correspondence. These levels and scores can help libraries find titles that meet specific reader needs, and can also help readers decide which titles are right for them.